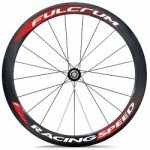 The Fulcrum Racing Speed XLR wheel is another for top competition use and is the latest carbon wheel - as used by Alessandro Ballan to win the 2008 world professional road race championships. The rim has a 50 millimetre profile and is supported by 18 radially-laced spokes in the front wheel and 21 in the rear with doubling on the freehub side using Two-to-One technology. Special brakes and pads are required. Weight: 575 g fron, 750 g rear. Plus: Carbon hub with alloy flanges, CULT ceramic bearing for smooth running and longevity, 50mm deep carbon rim, Aero stainless steel spokes, 18 radial spokes spoked front wheel, 21 spoke rear wheel, 2:1 spoke ratio for faster acceleration and a laterally stiffer wheel, Compatible with Shimano, SRAM or Campagnolo.